With both of these teams coming into this game with a 2-4 record, this is an ideal time to create a bit more positivity about the campaign and put some daylight between themselves and their opponent. Only two teams have poorer records so far in the Euroleague this season which makes this Tuesday night game a vital clash for both of these sides as they look to make their mark on this campaign. After 6 games of the season, Derrick Brown is the player that is having most impact for the hosts. This can be seen with his average of 12.8 points per game, which is the best on the roster although Thomas DeShaun is coming in close behind on an average of 12.5 points per game. Thomas Heurtel has provided an average of 11 points per game while Bryant Dunston and Cedi Osman have both delivered an average of 10.2 points per game. Tyler Honeycutt has provided an average of 8.2 rebounds so far this campaign and Heurtel has provided an average of 6.2 assists per game. Keith Langford has been far and away the star man for UNICS so far this season and he has managed to serve up an average of 24.5 points per game this season. If he can deliver that sort of showing in Istanbul on Tuesday night, the side from Kazan will have a much greater chance of grabbing a win and pushing up the Euroleague table. Coty Clarke has provided an average of 13.5 points per game this season. Clarke leads the way with an average of 7.5 rebounds per game this season and Anton Ponkrashov has delivered an average of 5.3 assists per game this season. With both teams struggling for form so far this season in the Euroleague, the basketball betting action for the match is a tough one to call. 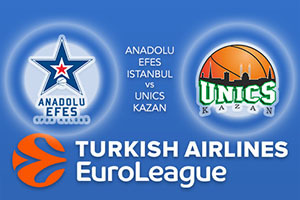 You should look to back Anadolu Efes Istanbul at -6 which you can find at odds of 1.90. Anyone looking for the Over/Under market should look to go UNDER 163.5 which you can find at odds of 1.90 for this Tuesday night clash in the Euroleague. Bet Now!